This early Gothic console originally supported a vaulting rib in the sacristy of the small French church of St. Martin-de-Candes. 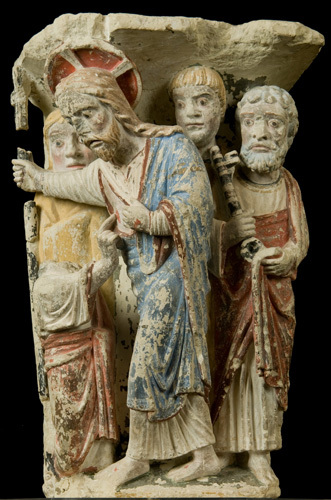 The sculpture, which retains much of its original coloring, illustrates the story of Doubting Thomas, an episode described in the New Testament gospel book of John. The apostle Thomas refused to accept that Christ had appeared to his other followers after the Resurrection, saying "Unless I see the nail marks in his hands and put my finger where the nails were, and put my hand into his side, I will not believe it." Christ appeared to them again one week later and told Thomas "Put your finger here; see my hands. Reach out your hand and put it into my side. Stop doubting and believe." The sculptor has utilized the architectural form of the console to depict this story. On the left, Thomas, his head now broken, places his finger in Christ's wound; Mary Magdalen, to whom Christ also appeared after the Resurrection, stands behind him. The apostle on the other side of Christ is Saint Peter, who holds the key to heaven. The remaining figures are apostles who serve as witnesses to the miracle. The figure of Christ originally carried a cross-staff, symbolizing his victory over death.